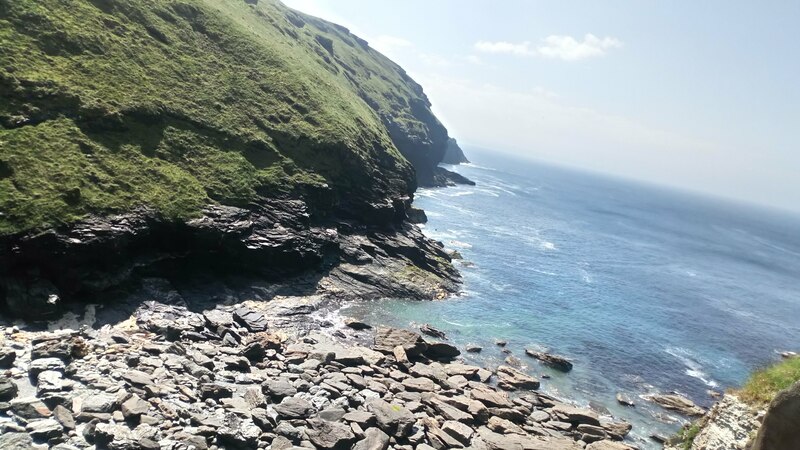 Picturesque panoramas of the Celtic sea make the climb to the English Heritage’s Tintagel Castle totally worth the effort. 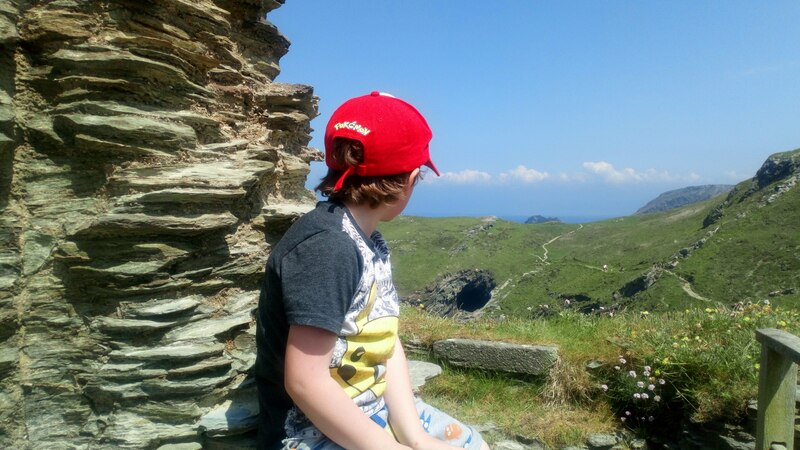 On our recent holiday, Noah and I were astounded by the beauty of Tintagel bay, located on the North coast of Cornwall. 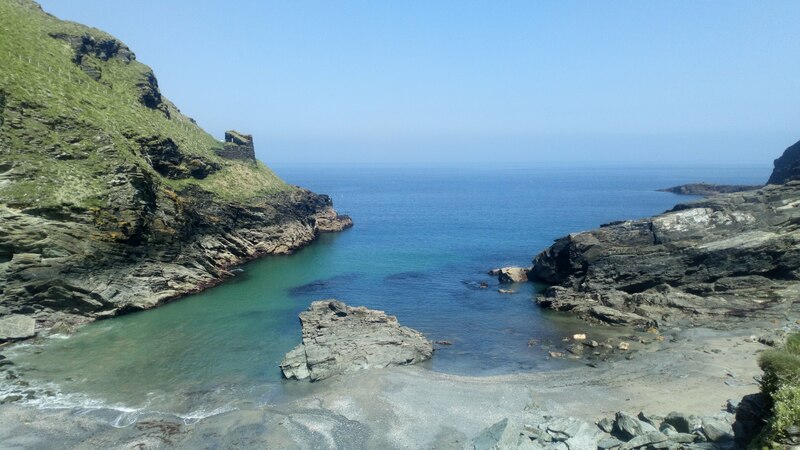 Tintagel has strong connections with folklore, with the area being featured in literary works as the birthplace of King Arthur and speculated as a setting for the tale of tragic lovers Tristan and Iseult. King Arthur’s car park has a large overflow and is just a couple of minutes walk from the footpath to the site of Tintagel Castle. 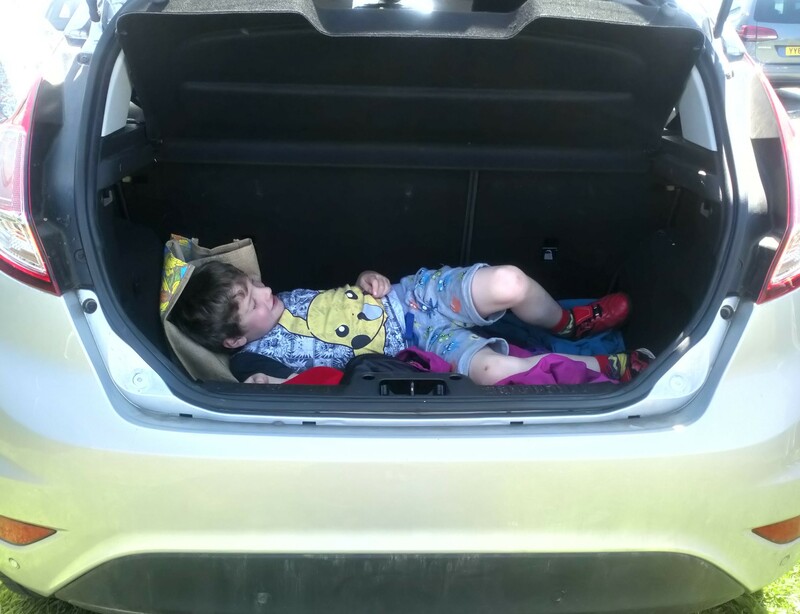 Before making our way down the path, Noah wanted to share his new idea for a place to have a nap. 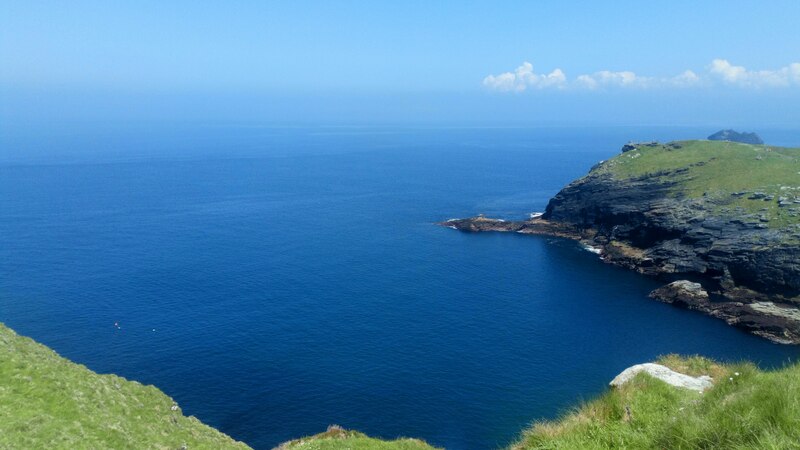 It’s a five to ten minute walk down a (sometimes quite steep) hill to the marvelous view of Tintagel Bay. We didn’t require a ticket to visit the bay so if you’re strapped for time we thoroughly recommend checking it out regardless of whether you will visit the ruins. The beautiful turquoise water is a stark contrast to the murky, clay saturated waters of the North Sea. This part of the cliff-side is riddled with footpaths to explore, as well as having a visitor’s centre, cafe, toilets and gift shop. 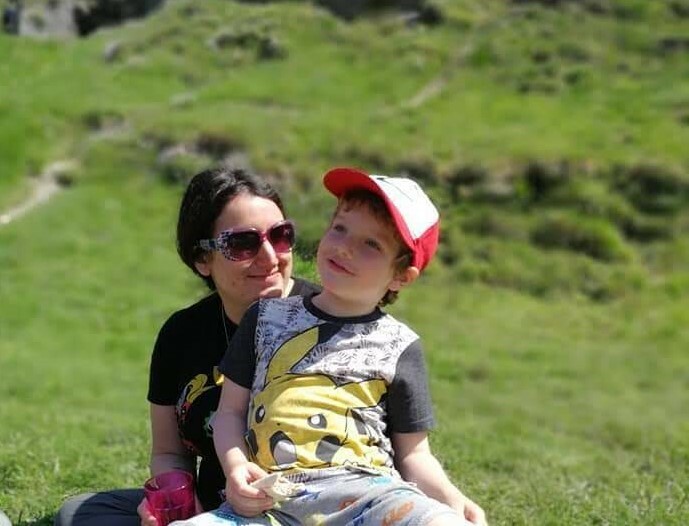 There are lots of grassy areas so it was the perfect spot to have our picnic. From here, the beach can usually be accessed. Disappointingly, the recent bad weather had damaged the steps leading down to the sand so the entrance was temporarily closed. Such a shame because we would have loved to investigate some of the caves we could see. There’s over a hundred steps leading up to the first collection of ruins. It was rather busy on the day we visited, so we had to stop many times to allow people on their way down to pass on the very narrow staircase. It’s a good job the view was so impressive. 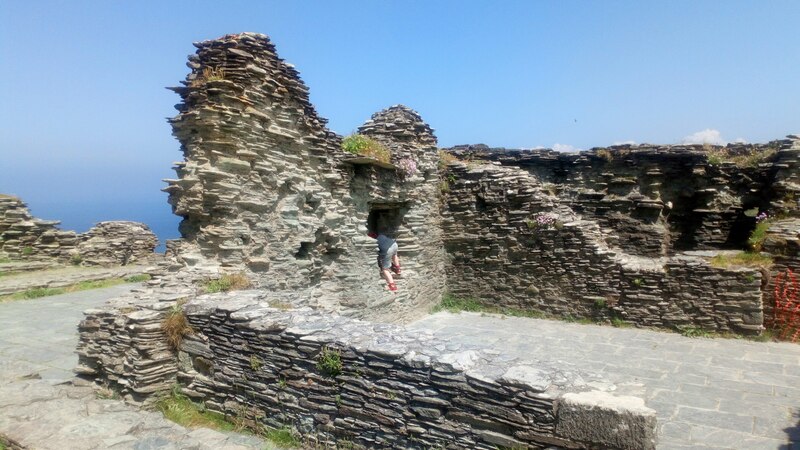 At the top, Noah climbed, jumped, balanced and wriggled his way through the ruins of the castle’s halls and service buildings. A Great Hall was erected in the 12th century, but what stands today is the remains of areas rebuilt in the 13th century after cliff erosion caused part of the hall to collapse. These rooms would have been used for lodgings and storing food. 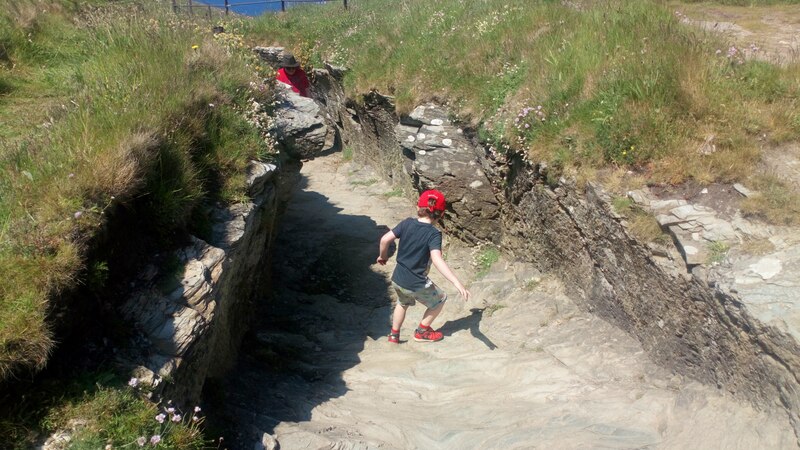 After a short rest, Noah, Grandad and I decided to venture further up the cliffside. Nana opted to stay at the ruins and enjoy the view. Noah raced on ahead up the jagged stones. 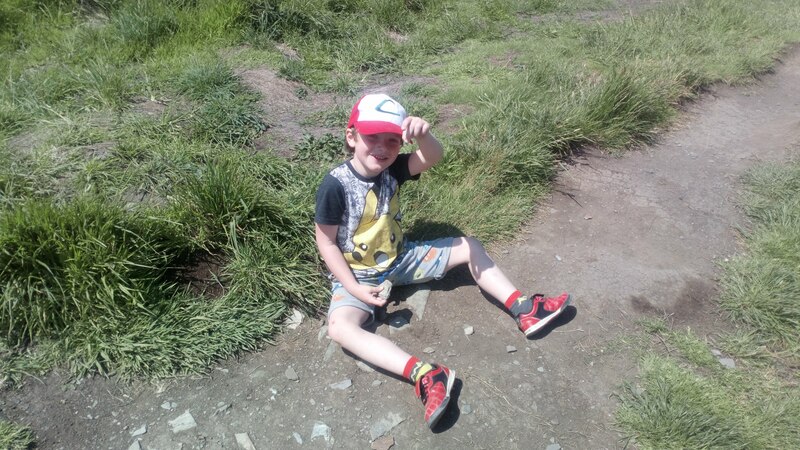 When we reached the top, he was sat on the floor; “I’m practicing being an archaeologist” he beamed. There was plenty of archaeological evidence to be discovered. We found the remains of a walled garden and a well. A man-made tunnel was fun to play in whilst we speculated what its purpose might have been. Historians say that it could have been a food store or garden feature. Towering above the bay, is a mysterious bronze sculpture of King Arthur whose installment has caused divided opinions among locals. Although striking, I was more interested in the layered rock formations beneath our feet that reminded me of some of the formations we saw in Iceland. There is so much more to discover, but the baking heat and climbing had tired us out. It was time to head back down, not forgetting to capture some pictures of the deep blue water. We visited the gift shop on the way out, where I was quite happy to sample the English Heritage’s cherry and strawberry wines (both delicious). Returning to the car park is an arduous trek back up the hill to the main road. There is a land rover service available for £2 per person. Tintagel Castle is located at Castle Rd, Tintagel PL34 0HE. The ruins are ticketed, but English Heritage members go free. Please check their website for the latest ticket prices and opening hours. We’d love to visit some more castles in the UK! Do you have any suggestions? Find out what we did with our photos from this holiday in our post about creating meaningful photo souvenirs. Fantastic! Have you got any ideas where you will visit? Somewhere I’d love to go – it looks so romantic and the colour of the sea there is extraordinary. Thanks for reading! I believe the statue was only installed recently, within the last year or so. From what I’ve read, its installation was quite a controversial issue in Tintagel. 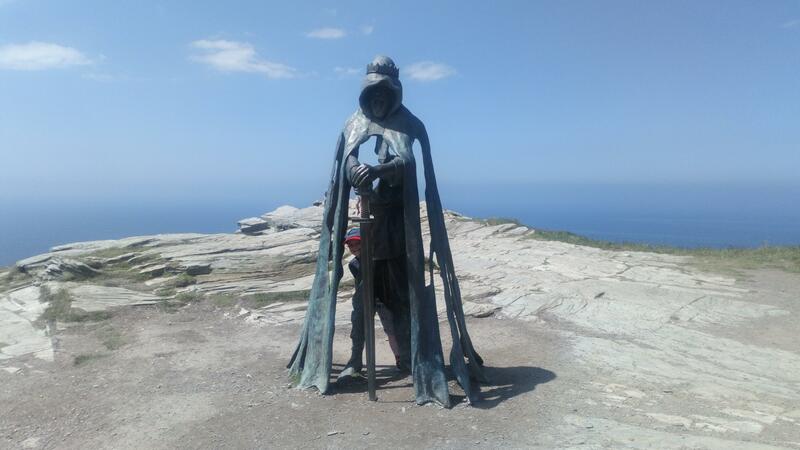 Tintagel sounds great, Esther, will visit next time we’re in Cornwall. Thanks for this post. We also liked St Ives, Porthcurno, and the Isles of Scilly. Pity the train from London still takes a long time, so we’ve not been back for three years. Hope to visit again this year, though.